After we had completed the day of Peach Day celebrations, we headed over and visited Grandma E and Grandpa Wayne. Our girls always enjoy going over and visiting them. This time was extra fun. Jade came across a trumpet mouth piece. So, Grandpa Wayne asked her to blow in it and see how she did. 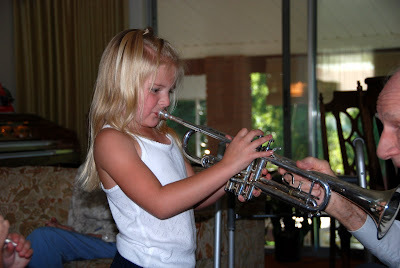 She was able to make some noise so, he had her go downstairs and bring up the trumpet. He taught her how to hold it and showed her how to change the tone. She actually made some music! 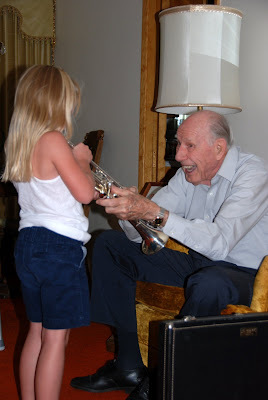 Grandpa Wayne said that if we want to get her started on this type of instrument, we should do a Cornet because it is smaller and easier for her little hands to hold. 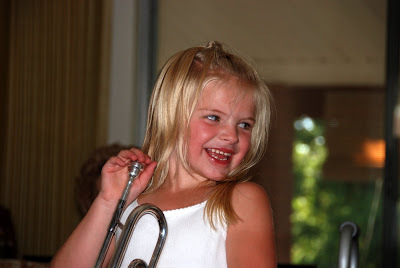 She's expressed interest in a flute (piccolo is what Grandpa suggested) but we'll just have to wait and see. 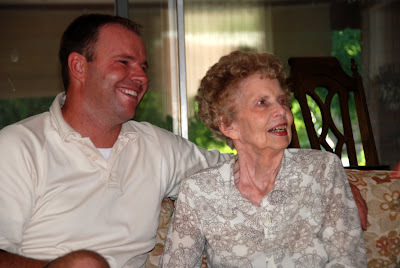 Here is my handsome husband with his sweet Grandma. It's been a rough several years for her, but she is always quick to smile and fun to go visit. This is what I love about visiting Grandpa Wayne and Grandma E. The great big smiles that they bring to the faces of our little girls. At the end of the evening (Grandpa Wayne joined us at Maddox), Jade climbed up and gave him a big hug and said, "I just love you Grandpa." All four of these photos are fantastic! Talk about capturing the personality and emotion of the moment... I'm not sure which smile I find more compelling, Jade's or grandpa's. Kudos! Priceless photos! Grandpa Wayne is a real family treasure.